We spotted this iguana after a 50-minute beach walk to the interesting little fishing village of Puerto Morelos, located between Cancun and Playa Del Carmen. 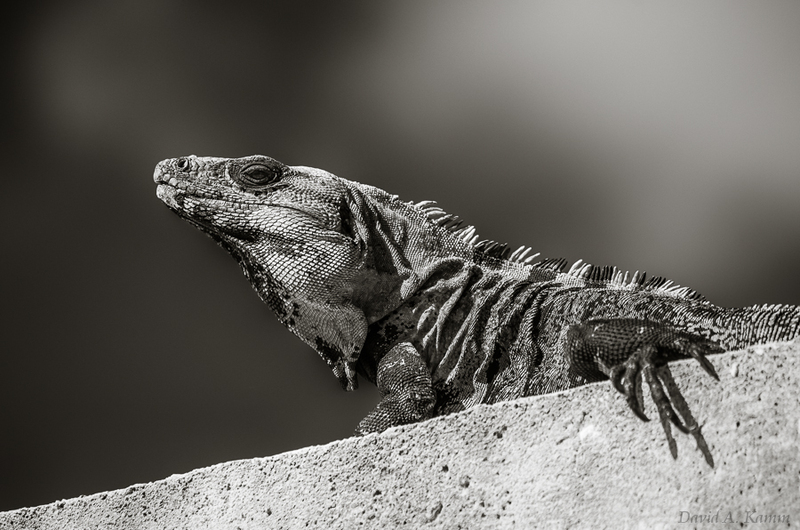 Shortly after turning right off the beach toward the small town center, we saw this iguana sunning itself up on a high wall near a construction site. Like most iguanas, he basically just sat there without moving much, slowly closing and opening his eyes every so often. It was easy to get several decent shots from a few feet away with a telephoto zoom lens. I decided to convert this image to black and white since I knew the blue sky and soft white clouds would allow for a really contrasty photo with lots of texture. I also like the ‘diagonals’ theme going on here. Lots of diagonal lines either explicit or implied. © 2019 David Kamm. All rights reserved.